The Azores are an archipelago of nine volcanic islands of breathtaking views and where Nature will leave you mesmerized. Here the nature and vegetation are untouched and pure. Because of the remote location, almost at the middle of the Atlantic, the traditional lifestyle of the Azores mostly remains unchanged. The island architecture is Portuguese with elegant centuries old buildings in its cities and a nature is unparalled. On these islands you can get fun and adventure or complete relaxation. You will experience unforgettable moments between whale watching, diving, walking trails, jeep safaris, biking, horseback riding and golf. Authentic and unspoiled , the Azores are a nature paradise, where you will lose yourself admiring its beauties at every step. 11 days/10 nights Sao Miguel, Terceira Faial, Pico. Visit the islands of flower paradise, stroll around hsitoric Terceira and Faial and take a boat ride to the sunny island of Pico famous for its excellent wines. 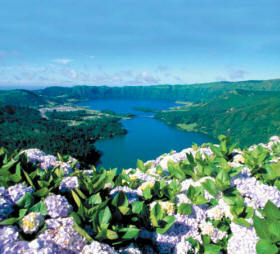 15 days/14 nights Sao Miguel, Flores, Faial, Terceira with Saturday departures. The most comprehensive island visit package. There is a network of approximately 60 mapped trails all over the green archipelago, all trails of great biogeological, historical and ethnographical interest. They are classified in accordance with their level of difficulty, distance and type of route . As you walk inland from the coast, you will enjoy a stunning landscape marked by dense coastal woods, juniper trees and the remains of lauris-silva forest. There are also waterfalls, vineyards, typical homes, windmills, fishing boats and corrals. On the coast, there are tidal pools nestling amongst rock formations, great for a refreshing swim! The Azores is one of the best places in the world for whale watching. Around the archipelago, approximately 25 different resident and migratory species can be spotted.